Flat Rock Rapids Camp was born on the back deck of the house I grew up in. 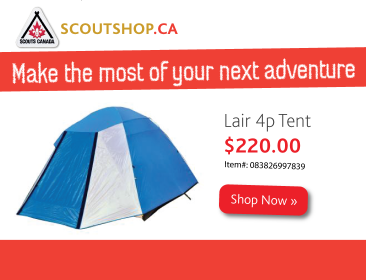 My dad and his Scouter friends sat in the sun on a warm afternoon in 1984 and decided that their camp plans would come to fruition the very next summer. 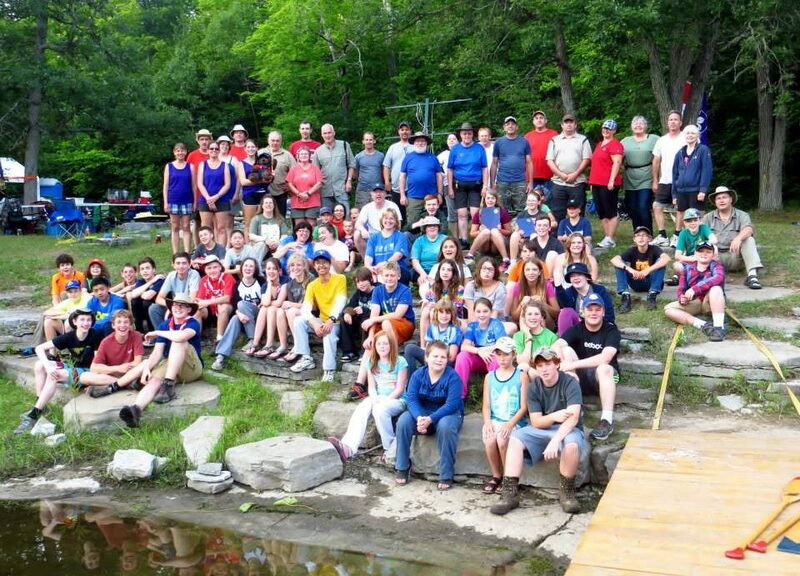 July 1985 scouts from all over Quinte Region gathered in Vanderwater Conservation Area, Thomasburg Ontario and had an amazing weekend. 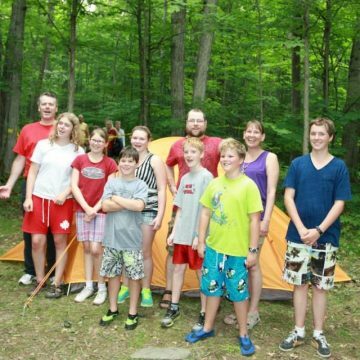 Canoeing, rope bridges, team skies, iron scout competition, archery, boiling water in a paper bag over a fire and other great projects of the time, inspired the campers and left them wanting more. 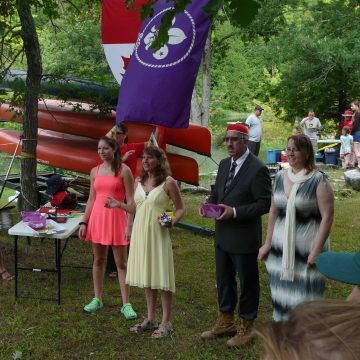 The camp carried on, the projects evolved, although some of the classics live forever, and the staff rotated but always kept the spirit of that first camp. 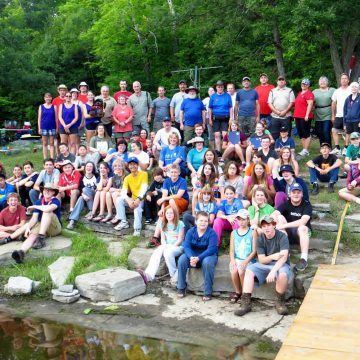 For the first 15 years of the camp’s life, it was even attended loyally by groups from the USA making it, Flat Rock Rapids International Camp. As a child I still remember waiting to see Buffalo, New York’s Explorer Post 607 pull into camp every year and tell us the amazing stories their group collected over a year of their camps and expeditions which included mind boggling tales of ice climbing on waterfalls all over the states. 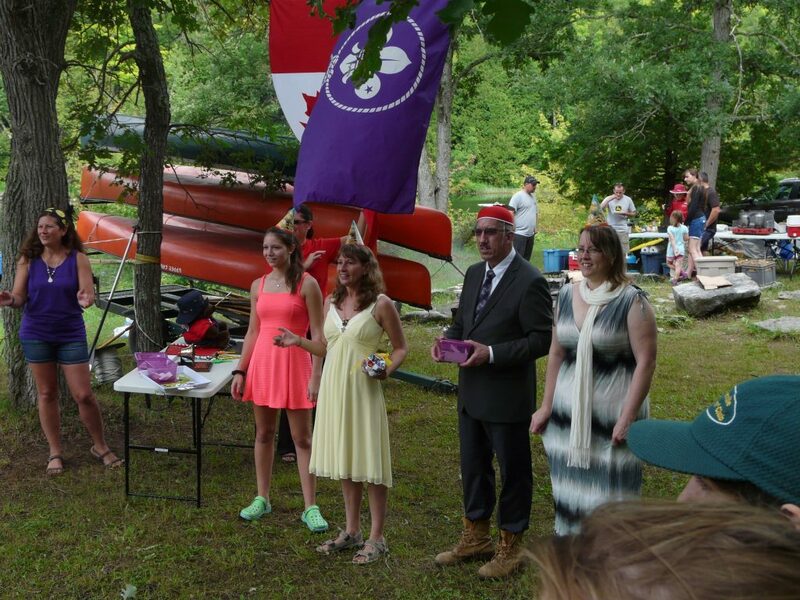 The young women in their group (Rover aged by Canada’s groups) were an inspiration of what girls could really do, not only within Scouting, but also to live larger than life. Much to the benefit of my sisters and I, my dad’s 1st Tweed Scout Troop were very tolerant of 3 girls tagging along and participating in the wonderful experiences they were having. Flat Rock Camp was no exception. 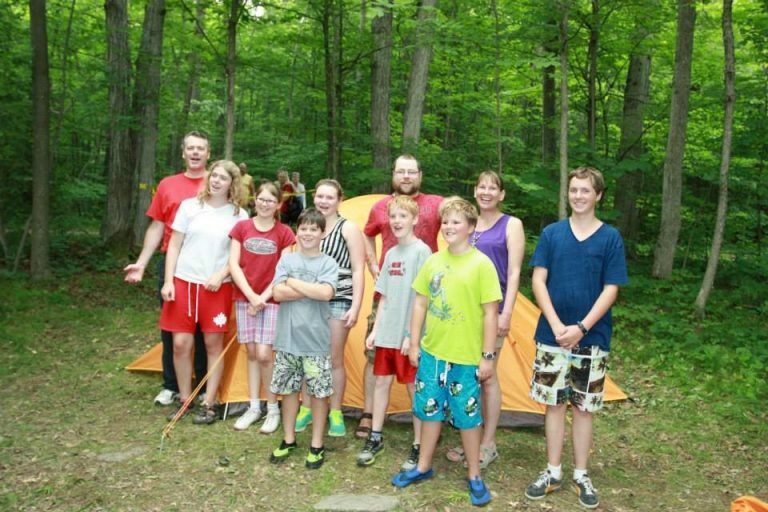 This camp was greatly anticipated every year and a part of my family and my upbringing. The camp has seen kids, fresh out of cubs, turn into adventure driven scouts, who then turned to venturers who have become junior leaders and rovers and are now returning with their own families and scouts. This camp seems to be something different and special from the average camp. On the banks of the Moira River we may have looked like we were just puddling in the shallow rapids but we were really appreciating the little things in life. You may have seen scouts learning to maneuverer the canoe slalom course and master canoe over canoe rescue, but what you really saw was young people gaining confidence in a skill that not everyone at their school would have. Instead of campfire, we hope that the bond of friendship and brotherhood came shining through brighter than the embers. Scouts may have been messing around on rope ladders but through the right pair of eyes you would have watched fun building confidence. 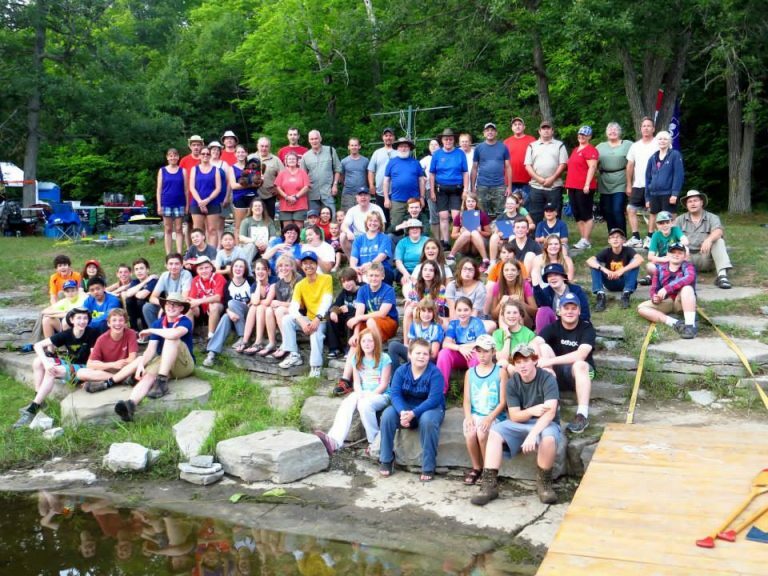 Scout’s own may have looked like 15 minute “session” that didn’t talk about YOUR God, but on the water’s edge seated on a stadium of tiered rocks, what we felt was a taste of spirituality that was inclusive of every living thing on earth. Fast forwarding through the years of Flat Rock, now the grown children of some of those founding men, have taken over in their shoes. This year we reached a very proud 31 years of that wonderful July event. Surviving through CJ years, evolution of program, and groups gearing down in the summer months…here we are as a camp, here I am as a volunteer of over 20 years and it was here I was first announced as the new staff member for this area, here I feel my roots and enjoy seeing other kids find their first passions for scouting, as I did.